Winter (Of Workouts) is coming… – Zombies, Run! At Six to Start, we like to keep things moving. Partly because it’s starting to get a little chilly here in London, but mostly because nothing makes us happier than bringing brand new experiences to players around the world. Zombies, Run!, The Walk, and Superhero Workout have inspired over a million of you to challenge yourselves and improve your fitness… but there’s plenty more fun to be had. So, we’re doing something a little different this Winter. Over the next month, we’ll be marking the holiday season with not one, but four new releases! We’re calling this event the Winter of Workouts. For now, it’s time to dust off your best suit of armour and meet our first new game: Dungeon Runner. Enemies gathering, magic crackling, health points dwindling. A tense battle in any adventure game can get the heart racing, but we’ll do it literally. To make it through the levels in Dungeon Runner, you’ll have to move. For real. Dungeon Runner uses the same advanced motion-tracking technology as Superhero Workout. Instead of an alien-smashing supersuit though, this hero carries a sword and shield into battle with the evil Dungeon Lord. 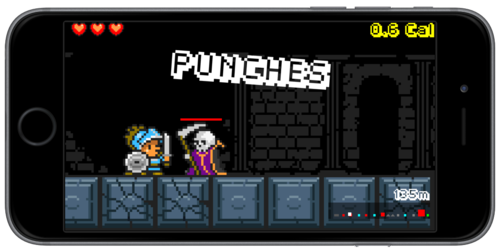 In this 8-bit adventure you’ll fight fiends, smash urns, and surmount bottomless pits – all using bodyweight exercises tracked by your phone or tablet’s camera! Here’s the coolest part – Dungeon Runner is out on iOS right now, and it’s available for free! Previous Post Supply Pack Detected!